Brimmer hires highly skilled, enthusiastic, and dedicated staff, many of whom are teachers trained in early childhood, elementary, and/or secondary education. Activity Specialists—all of whom are over 21 years old— are professionals and experts in their field. Every staff member hired is both a role model and a mentor committed to making our campers' summers positively unforgettable. Thank you for your interest in working at Brimmer and May Summer Camp! Please download the application, fill it out, then scan and email it to camp@brimmer.org. We begin reviewing applications and setting up first-round interviews in early January. Salaries are based on years of experience and program responsibilities. The Counselor-in-Training program at Brimmer and May will provide an opportunity for students entering ninth and tenth grade to teach and work with younger campers as apprentice counselors while learning the ropes. CITs (also known as Campers-in-Transition) are under the supervision and direction of experienced professional staff. CITs will get an opportunity to work with each age group, and when appropriate, be asked to lead activities. Weekly meetings provide feedback and guidance throughout the summer. Click here for more details. Cassandra fell in love with teaching in the late 1990s when she was living and working in post-apartheid South Africa, implementing a library project for WorldTeach International. She has also worked as a special education teaching assistant at Wellesley High School and the program director for Camp Wingate Kirkland in Yarmouthport, Mass., for several summers. Most recently, Cassandra served as assistant district attorney in the Bronx County District Attorney’s Office in New York City. During her 10 years there, she developed an Anti-Human Trafficking division of the organized crime division called the Rackets Division. She also served as an anti-gun trafficking and Narcotics Division prosecutor. Cassandra is excited to be back in education and be a part of the Brimmer community. Cassandra is a member of the American Camping Association and the Massachusetts Camping Association, where she is a board member at large/legislative chair. She is a former member of the New York State Bar Association and Bronx Women’s Bar Association. In her spare time, Cassandra is a volunteer coach for young soccer goalkeepers and enjoys speaking to high school and college students about social justice issues, finding a first job, women’s empowerment issues, and career transitions. As a former soccer and rugby player at Amherst College who went to the Final Four of the Division III NCAA championships, Cassandra also enjoys talking to young people about being a college athlete. Ashley is a behavior therapist in the Newton Public School system duing the school year. Previously, she worked in special education in Brookline. She loves being part of the caring and intentional community at Brimmer Summer Camp. She is passionate about the healthy social and emotional development of young children and knows that camp is an integral part of that development. After graduating from University of New Hampshire she spent time in Cambodia with the US Peace Corps. All Staff arrive at camp at 8:15 a.m. every day to prepare for camper arrival at 8:30 a.m.
Counselors move from activity to activity with their groups. All activities are run by a specialist and counselors are there to assist the specialists and make sure campers are having fun. Specialists have a designated space where they meet with each group at various times during the week. There is also time for planning and collaboration with other specialists. Thank you for your interest in working at Brimmer and May Summer Camp! Please download the application, fill it out, then scan and email it to camp@brimmer.org. We begin reviewing applications and setting up first-round interviews in early January. We will contact you to set up an interview. Staff are asked to dress appropriately and professionally for the camp environment. All staff are required to wear their camp t-shirt every day. Three shirts are provided to each staff member at the beginning of the summer. Sneakers must also be worn every day. All staff must attend a mandatory orientation before camp begins. 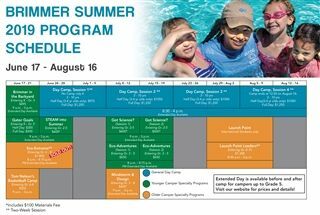 The orientation covers everything you will need to make the summer successful and fun for our campers. Topics include; typical camp day, safety, games & songs, and the camps basic policies and procedures.